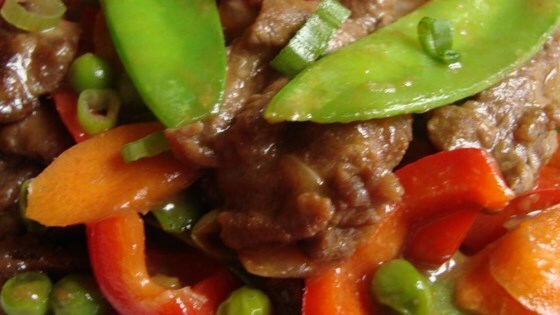 "This is an easy Pinoy recipe if you don't have much time. The beef can be sliced and marinated ahead of time making the meat even tastier. Eat the dish alone or serve with rice. Use a tender cut such as New York steak or prime rib." Heat 2 tablespoons oil in a separate skillet. Remove the beef from the marinade, shaking off any excess moisture; discard the marinade. Fry the beef slices in the hot oil to your desired degree of doneness, 3 to 5 minutes per side for medium. Add the cooked beef to the vegetable mixture and mix well. Serve hot. Done in under 30 minutes, this is perfect for a weeknight dinner. This was delishous!!! It was even better because I marinated it for 2 whole days!!!! Made this tonight and really liked it. I did double the sauce and added a couple shakes of red pepper. It was very easy and quick to make, and will definitely make this again. I thought this was an excellent dish. I used a little over half the meat and just eye balled the veggies. I don't think you can go wrong with this recipe!